All the post made during the selection phases, to keep you informed of my progress and (hopefully positive) results. So I’ve already been in SD for a week now. Time has been flying by and I’ve already lost all sense of what day of the week it is. Since weekends are just as much school days any other day and lessons are scheduled throughout the day, it does take some getting used to. But in aviation everything goes on 24/7/365, so it’s good to get used to it as soon as possible. So let me get you up to speed, since the last time I posted was over a week ago, before my first day of school. On monday we had our first day of introduction and it started of with Sandy, who’s responsible for housing at SAA, coming over to see if everything was OK with our appartement. After that we were picked up by the bus driver and taken to the SAA facilities at Gillespie Field. There we had a long day of be introduced to a lot of instructors and other people responsible for our training at SAA, as well as getting an overview of what our training will look like, by the JAA Chief instructor. On Tuesday we went to the bank were I opened an American checking account and got more information on SAA and we got most of our books and a lot of other stuff we’ll be needing here: manuals for the planes we’ll be flying, charts and related instruments, all the stuff we need to do preflight checks and a headset. After that we had to go to a nearby doctor and get our class 2 FAA medical certificate and a student pilot license. That was a piece of cake, after having undergone a class 1 medical evaluation for the JAA back home. So no trouble there. Afterwards we got a “tour” of SD, which consisted of driving back to El Cajon. But I’m sure we’ll get to see San Diego before we leave. Wednesday was a short day, which was nice. Because I was still kind of jetlagged then and having the rest of the day of gave the opportunity to get a little shut eye. As we were to start our first classes the next day, we did have some preperation to do. As of then we’ve been pretty much spending our days learning and being in class. Last Saturday we also had to do some moving. Judith (a Belgian girl), who lived a few appartements down, changed rooms with Anessa (the Taiwanese girl in our apartment). So now we’re an all Dutch speaking apartment, which makes communicating a lot easier! Yesterday I also had my first flight! That was really great. There was a lot of fog at first, so I was really dreading the fact that flying would not be possible. Luckily the fog lifted just in time for take-off! I spend about an hour in the air with my instructor, who let me do most of the flying. 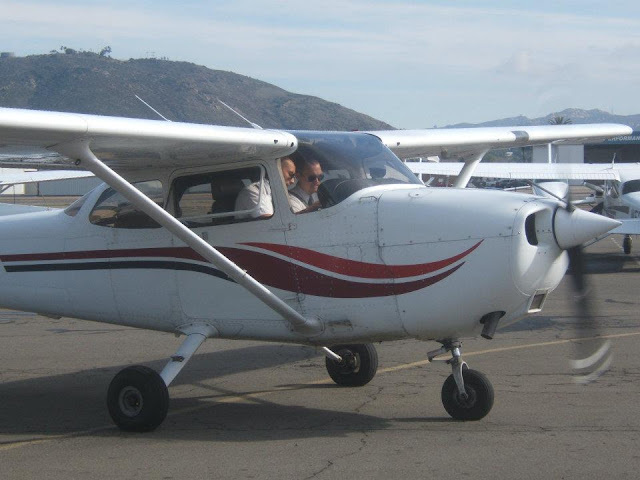 This was just an introductory flight, to let me get a feel of the plane and of flying a Cessna 172. It was a whole lot of fun! I can’t wait to get up again. Now I have to wait for the TSA to approve me for flight training, so I can do some more flying! I’m off to the airfield for some more classes, so until next time and byebye for now.